Griffith's Spring is a shaded and peaceful one-mile loop trail that is close to Flagstaff and is an excellent example of a riparian habitat. James Griffith was a Civil War veteran that came west to homestead in the late 1800's. The spring was part of the homestead which consisted of over 160 acres of diverse countryside. Following the trail to the right at the beginning of the loop, you'll walk through a Ponderosa pine forest on a wide, well-maintained path. The trail follows a small canyon to a tank that forms a stream in late summer months after heavy rains. Near the stream you may see wild iris, lupine and hear western bluebirds, robins and hummingbirds. Continuing on up the trail a short distance you'll find Griffith's Spring. 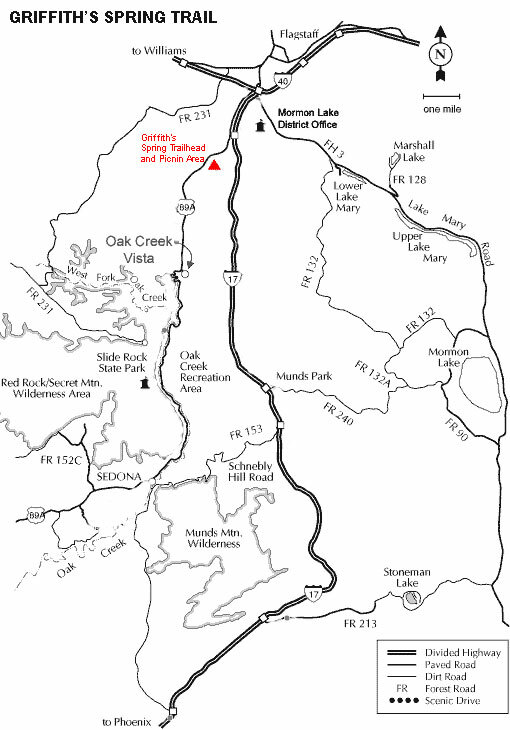 This spring runs into Pump House Wash, then eventually into Oak Creek. There is a board crossing the spring, but you will turn around and rejoin the trail going to the right to complete the loop. Drive south on 89A approximately 2 miles past the Flagstaff Airport exit and Fort Tuthill. The Griffith Springs day-use area is signed appropriately and will be on the left (east) side of Highway 89A.